For a distinguished man interested in color with his wedding band, a white gold and sapphire men's wedding ring can be elegant and beautiful. The rich blue of sapphires contrasts with the luster of white gold, and there are many outstanding designs to choose from. For purchasing information in any of the slideshows, click on the 'buy now' link at the bottom of the image. A simple men's wedding ring may have small sapphires and diamonds inset into the band. This is a subtle design that still brings a bit of colorful sparkle to his ring finger. A wedding ring with just a plain, simple sapphire is an understated but elegant choice. Simple texturing on band, such as ridges, notches, braids or crosshatching, adds more detail without needing additional gemstones. Thick, bold gemstone shapes are popular in men's wedding rings. A barrel shaped stone is a unique and distinguished choice that will show off the depth of a sapphire's color. 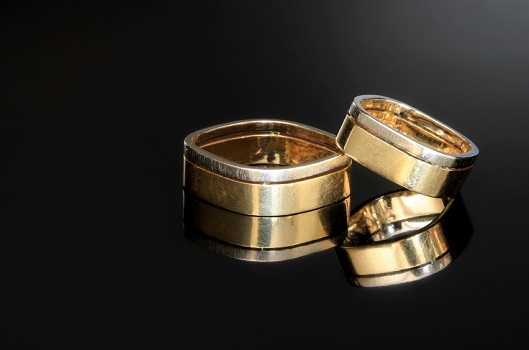 A three stone wedding ring is a highly symbolic choice for men or women. The three stones represent the couple's past, present, and future, and pairing sapphires and diamonds together makes this ring even more distinctive. The simple ridge around the ring's circumference adds another textural dimension and symbolically connects the stones. Bezel set sapphires and diamonds are a stunning choice for a man's wedding ring. The understated simplicity of inset jewels will appeal to many men's jewelry fashion tastes. For a more unique and eye-catching ring, opt for an oval sapphire instead of a faceted stone. This two-tone and sapphire men's wedding ring features an oval star sapphire flanked by two diamonds to add extra brilliance without detracting from the lovely sapphire pattern. A man who wants to make a bolder fashion statement may prefer a more elaborate wedding ring with a repeating pattern of sapphires and diamonds. The uneven edges of this ring garner even more attention without being too outrageous. For a wedding ring with bling, consider a pave set wide wedding ring with sapphires and diamonds. Alternating rows of the stones will highlight their contrasts, but the symmetrical pattern keeps the ring pleasing to the eye. Channel settings are popular for men's wedding rings because the diamonds and gemstones are well protected. A central row of princess cut sapphires is bold and strong, and flanking them with rows of diamonds adds brilliance and beauty. Small details can make even a simple man's ring more elegant. Instead of just one stone, flank the sapphire with small diamonds for added sparkle, and texture the ring with ridges or carvings for additional detail without too many gems. While white gold is rich and lovely against the cool blue of a sapphire, edging the ring in yellow gold is a beautiful way to incorporate the classic look of a traditional gold wedding band. If you can't find the right white gold and sapphire men's wedding ring at your favorite jeweler, investigate antique rings and estate sales for more options. Sapphires are popular in Art Deco and older rings, and it may be easier than you think to find a unique wedding ring. See Pictures of Unique Alternative Wedding Rings for more interesting wedding ring ideas.